Visit the image gallery at Tilt. 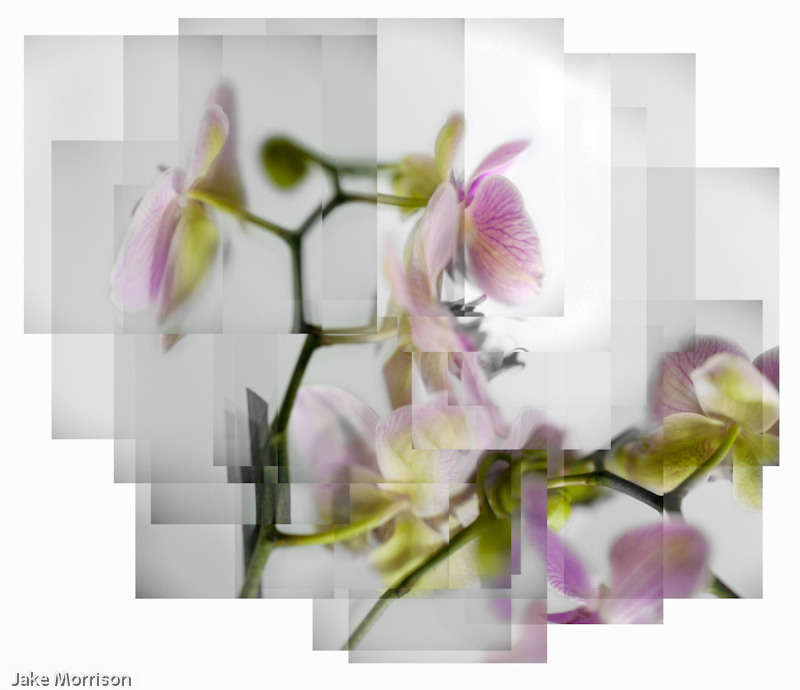 My work for “Tilt”, the photographic show of collective (Kokotailo - Austin - Morrison) for FestivalX 2012 at Orange Gallery in Ottawa, comes from my fascination with Hockney’s work in photography. My intent has been to explore his insights into depicting space & time through photographic capture but with the addition of the digital tools that I have come to use over the last decade. Those tools provide the ability to manipulate images in many ways but the most exciting use for this project has been that they allow the artist to shift the surface through the use of selective transparency. This can add a powerful dimension. While I can’t say that I have succeeded with these images in accomplishing my goals, their beauty has caused me to pause for a moment on my journey in order to show them. The journey continues. I performed 10 different “experiments” from mid February through mid-April, 2012. · The subjects of the shoots were two different pots of phaleonopsis orchids, two different pots of dried flower arrangements and a potted hyacinth. · Most images were taken in a small studio setup consisting of a portable blue backing, a white sheet and two 5000k CF continuous lights with various light modifiers. Claudia Coutu Radmore has created some poems inspired by the prints. She participated in the “Call and Response” poetry/imagery project at Ottawa’s SPAO photographic school this last season. I was so taken with the idea that I asked if she’d be interested in orchids. She was.